One way to help ensure that you are always up to date on breaking news is to have LinkedIn deliver the news to you. Instead of the paperboy dropping off your customized newspaper on your doorstep, LinkedIn can send you a digest of your top news articles to your e-mail address. Hover your mouse over your profile icon at the top right of any LinkedIn page. When the Account & Settings menu comes up, click the Manage link next to Privacy Settings. This brings up the main settings page. Click the Communications link on the left-hand side of the page. Under the Emails and Notifications header, click the link for Set the Frequency of Emails. This brings up the Email Frequency screen. From this screen, you can decide when and how frequently LinkedIn notifies you of actions related to your LinkedIn account. Click the pencil icon next to Updates and News to expand that section. You see a number of options. Pick the frequency with which you want to receive a digest of news stories. 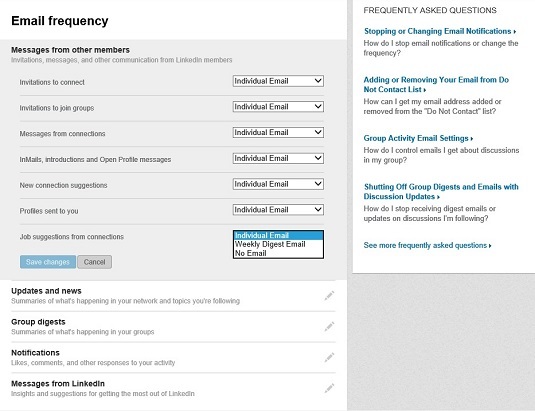 Click the down arrow for the option next to LinkedIn Pulse, and select Daily Digest Email, Weekly Digest Email, or No Email. Click the blue Save Changes button to save your selection and complete the process.